Evergreen tree, one of the most characteristic of Palestine. 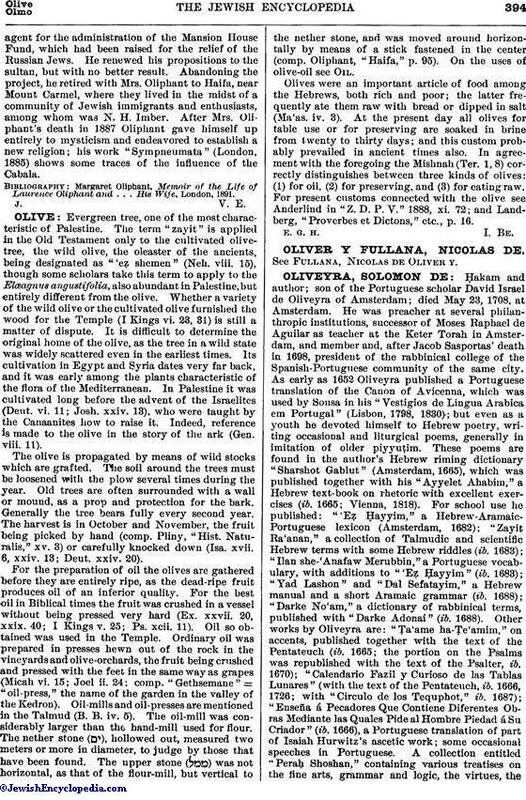 The term "zayit" is applied in the Old Testament only to the cultivated olive-tree, the wild olive, the oleaster of the ancients, being designated as "'eẓ shemen" (Neh. viii. 15), though some scholars take this term to apply to the Elæagnus angustifolia, also abundant in Palestine, but entirely different from the olive. Whether a variety of the wild olive or the cultivated olive furnished the wood for the Temple (I Kings vi. 23, 31) is still a matter of dispute. It is difficult to determine the original home of the olive, as the tree in a wild state was widely scattered even in the earliest times. Its cultivation in Egypt and Syria dates very far back, and it was early among the plants characteristic of the flora of the Mediterranean. In Palestine it was cultivated long before the advent of the Israelites (Deut. vi. 11; Josh. xxiv. 13), who were taught by the Canaanites how to raise it. Indeed, reference is made to the olive in the story of the ark (Gen. viii. 11). The olive is propagated by means of wild stocks which are grafted. The soil around the trees must be loosened with the plow several times during the year. Old trees are often surrounded with a wall or mound, as a prop and protection for the bark. Generally the tree bears fully every second year. The harvest is in October and November, the fruit being picked by hand (comp. Pliny, "Hist. Naturalis," xv. 3) or carefully knocked down (Isa. xvii. 6, xxiv. 13; Deut. xxiv. 20). For the preparation of oil the olives are gathered before they are entirely ripe, as the dead-ripe fruit produces oil of an inferior quality. For the best oil in Biblical times the fruit was crushed in a vessel without being pressed very hard (Ex. xxvii. 20, xxix. 40; I Kings v. 25; Ps. xcii. 11). Oil so obtained was used in the Temple. Ordinary oil was prepared in presses hewn out of the rock in the vineyards and olive-orchards, the fruit being crushed and pressed with the feet in the same way as grapes (Micah vi. 15; Joel ii. 24; comp. "Gethsemane" = "oil-press," the name of the garden in the valley of the Kedron). Oil-mills and oil-presses are mentioned in the Talmud (B. B. iv. 5). The oil-mill was considerably larger than the hand-mill used for flour. The nether stone ( ), hollowed out, measured two meters or more in diameter, to judge by those that have been found. The upper stone ( ) was not horizontal, as that of the flour-mill, but vertical to the nether stone, and was moved around horizontally by means of a stick fastened in the center (comp. Oliphant, "Haifa," p. 95). On the uses of olive-oil see Oil. Olives were an important article of food among the Hebrews, both rich and poor; the latter frequently ate them raw with bread or dipped in salt (Ma'as. iv. 3). At the present day all olives for table use or for preserving are soaked in brine from twenty to thirty days; and this custom probably prevailed in ancient times also. In agreement with the foregoing the Mishnah (Ter. 1, 8) correctly distinguishes between three kinds of olives: (1) for oil, (2) for preserving, and (3) for eating raw. For present customs connected with the olive see Anderlind in "Z. D. P. V." 1888, xi. 72; and Landberg, "Proverbes et Dictons," etc., p. 16.